Total Score: 7.17 + INNOVATION AWARD! 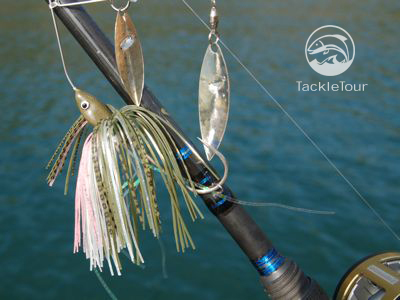 Introduction: In October of 2007, we introduced you to a new line of spinnerbaits by Kevkel, a small, Northern California baitmaker. These handmade baits with hand tied skirts featured unique, louvered, willow leaf (lourveredleaf) blades that promised to turn even at the slowest of retrieves making an already effective bait just a little more versatile. 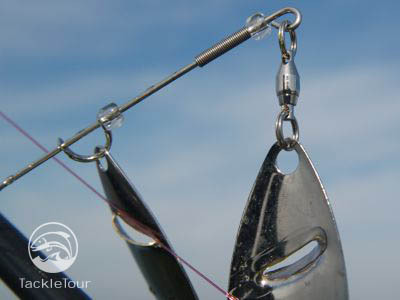 Today, we bring to you our full review on the Kevkel Double LouveredLeaf Spinnerbait. Impressions: At first glance, there's nothing terribly unique about the Kevkel Spinnerbait. 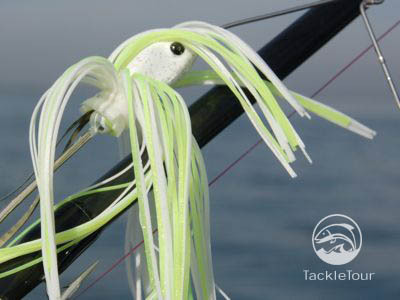 It does have some nice features including a custom painted head, mylar strips for added flash in the skirt, and a longer than usual shank on the bait's Gamakatsu hook. All welcome but really, almost expected features on any spinnerbait approaching $10 retail. But of course, the story with this bait is about those louvered blades. It seems simple enough really. Take a standard willow leaf blade, cut a slit all the way through the blade but at an angle, push some of the blade out, finish the edges to protect them from oxidization and there you have it, a louveredleaf blade. But what's the benefit? In theory, this little tweak allows the blade to catch more water enabling them to turn even at the slowest of speeds - something not normally feasible with standard willowleaf blades where speed matters. The Field Tests: Do they work? Well of course, there's only one way to find out. 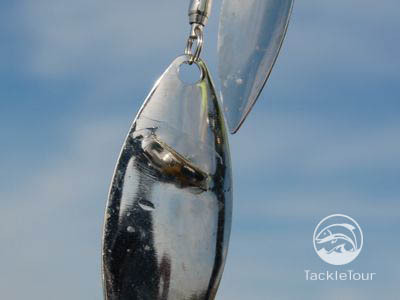 We took to the waters of Northern California with a handful of these baits to see what they had and fished them against other, similarly configured blades to judge effectiveness. With over 50 different skirt combinations on top of a few different blade color options, it can be a bit dizzying trying to decide upon product from this company. Fortunately though, when it comes to blades, the TT Staff keep it rather simple. Both JIP and Zander prefer white skirts where as I prefer white and chartreuse. I certainly have others, but the one I tie on most is white and chartreuse. Tied on and ready to go. 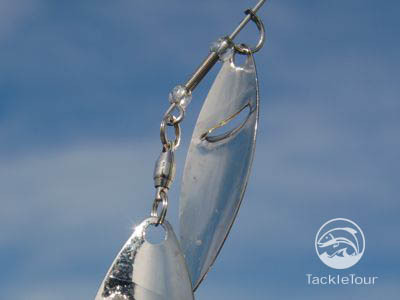 Casting: Obviously, the Kevkel Double LouveredLeaf Spinnerbait casts the same as just about any other blade out there possessing a similar blade configuration. There is no mystery here. The blades' tendency to foul on cast is average though on very rare occasion, the blades will become entangled with one another via their louvers. This happened on two occasions over several months of use. A close-up of the unique louveredleaf blade. If you look closely, you can see the clear nail polish coat protecting the louvered cut. 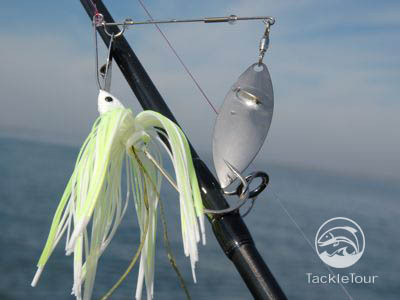 The Fall: Dropped next to the boat in clear water situations, you can see both blades producing that helicopter spiral usually reserved for the top blade of a double willow leaf spinnerbait only. It appears the louveredleaf has some benefit after all. To be certain, we pulled out a double willow leaf spinnerbait by another manufacturer and compared side by side. On repeated attempts, the Kevkel LouveredLeaf blades both turned maybe 50% of the time. 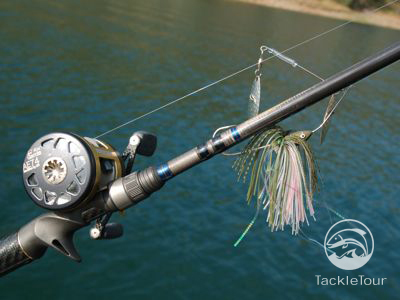 With repeated jigging, there were times the blades would just get in the way of one another and either not turn at all or just the large blade would turn. The competitor's product had similar problems the majority of the time and it did seem the Kevkel blade was more reliable worked in this manner. What's more, when the competitor's product did have some helicoptering action, it was only with the top blade.